No matter how much safety training people receive before getting on a boat, it seems that many individuals toss those safety guidelines overboard as soon as they’re out on the water. Alcohol and boating seem to go hand in hand, but the probability of being involved in a boating accident doubles when alcohol is involved. While we know that boating safety and drinking is a dry topic, especially coming from a boat insurance company, you may be shocked by some of the statistics gathered here. While the authors of this research conclude that more studies need to be conducted concerning the use of alcohol and recreational water sports, many statistics have shown the increased need for actions such as Operation Dry Water. This BUI (Boating Under the Influence) initiative shows that 19% of all boating fatalities result from alcohol use. Drinking on the water is not illegal, no more than it’s illegal for you to drink at a bar down the street. It is illegal, however, to operate a boat while under the influence of drugs or alcohol. Operating a boat on the water while intoxicated is like driving a potential lethal weapon. Last year, 672 deaths occurred from boating accidents, and alcohol was the number one contributing factor. The Centers for Disease Control states that among adolescents and adults, alcohol use is involved in up to 70% of deaths associated with water recreation, almost a quarter of emergency departments visits for drowning, and about one in five reported boating deaths. Fourth of July weekend is, notoriously, one of the craziest times to be on the water. Some boat owners won’t risk the effort anymore, as the fun can be marred in an instant by a drunken boat operator. Some states are more dangerous than others for a number of reasons. For instance, Florida again leads the nation in boating accidents, with 742 boating incidents and 67 fatalities. However, boating is a year-round activity in that state, which is home to the most registered boats in the country. 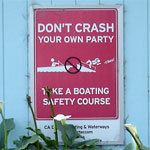 The leading cause of death was drowning, and many accidents included crashing into other boats. Statistically, some other states experience some equally disturbing numbers. Tim Smalley, boat and water safety information officer for the Minnesota Department of Natural Resources, stated that alcohol-related deaths are becoming a larger portion of all boating deaths in Minnesota. Prior to last year, alcohol was found in 30 percent of boating fatalities. In 2011, 50 percent of those killed while boating had alcohol in their system. The effects of being on a boat and drinking are more severe than being on land and drinking. Constant motion and vibration, sun, and engine noise, all combine to increase impairment. The Coast Guard estimates that in over half the boating deaths involving alcohol, the victims fell overboard or capsized their boat. An intoxicated person in the water faces a double danger — being unaware of the onset of hypothermia and increased disorientation resulting from inner ear disturbances. Alcohol influences balance, coordination, and judgment, and its effects are heightened by sun exposure and heat. The lack of safety measures on the water can be disturbing. For instance, Alabama currently is the only state that requires a boating license. That boating license is required for all persons 12 years of age and older who operate a motorized vessel on Alabama waters. This fact alone should scare any boat owner who might believe that every boat operator in the continental U.S. has at least gone through a boat safety course. Washington state law requires boat operators to carry a Washington State Boater Education card when operating motorboats with 15 horsepower or greater, and Arkansas requires that anyone born on or after Jan. 1, 1986, and of legal age to operate a motorboat or sailboat to successfully completed an approved AGFC Boating Education Course and carry proof while operating a motorboat or sailboat on Arkansas water. Nebraska law requires any motorboat operator (including personal watercraft) born after December 31, 1985, to complete a Boating Safety Course and be in possession of a course certificate when operating the boat. But, some other states like Alaska, California, Hawaii, Idaho, and Wyoming, do not require a boat safety course to operate a boat. States such as Minnesota do require boat safety courses, but that stipulation applies only to some operators of boats and/or personal watercraft. If you’re curious about your state laws, visit the United States Power Squadrons’ list of state-by-state boating course laws. Boat safety courses don’t eliminate accidents nor drinking while on board; however, boat owners may learn what safety equipment is required on board as well as about the life jacket issue. A life jacket on the water is just as important as a seat belt in a car, because seat belts and life jackets could save lives. 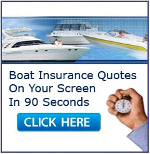 As an added plus, if you take a boat safety course you could receive a discount on your boat insurance. If you’re going to drink while on a boat, do just as you might do if you’re drinking on land — bring along a designated driver (DD). Remember — unless you plan to spend the night on your boat, you also need to drive home once you dock. Treat that DD right — because that person could save your life. Most of the time I only boat on lakes where alcohol isn’t even allowed at all, so I wouldn’t call myself an expert on the subject. But I totally agree with the point about a DD. Same rules apply as driving a car. Assign a DD and only boat with friends that are responsible when drinking. I realize that doesn’t fix the problem of other people out there, but at least you are doing your part. Safety on the water begins with knowing what to do and common sense. Even a drunk that understands the “Rules of the Road” has a chance, while a drunk that has no experience leaves us with no chance at all. What does 30%–70% mean? Almost none to almost all? Also it appears this article looks at drowning statistics, not driving fatalities. If 70% of people on the water are drinking, it stands to reason that 70% of drownings would have also been drinking. I agree that drinking and driving is unsafe, but this article exagerates the statistics. Be safe everyone. Boaters with lack of experience are the most dangerous boaters. Having been boating, skiing, and Wakeboarding in Florida for 40+ years, (engine hours 400+ for average year), have witnessed many accidents and many close calls. Some have had alcohol involved as a contributing factor, but they all had lack of experience as the primary factor. At any boat ramp in the USA you see it played out every weekend. First time boaters who have taken their boaters safety course but still have no clue what they are doing. Having captained boats from 20’ to 60’ time on the water operating a boat is the only way to operate a boat safely. My kids were taught at an early age respect for boating and respect for the water. My son at 12 was safer and a better boater then 90% of the boaters we see on the water. In Florida we have learner’s permits for driving cars for first time drivers; we should have the same requirements with boating with required logged hours before a license is issued. I do not promote drinking and boating, but if the option was presented to ride with an experienced boater who had been drinking or a first time boater I would always pick the experienced boater. Been on the water for over 25 years. The bad thing about being a non drinker is you are aware of all the stupid things the drinkers are doing. Drinkers don’t care what other drinkers are doing. I am on a small inland lake and statistics show over 65% of the accidents and deaths are alcohol related ! Of course like many lakes we have a Party Cove and a majority of those people feel that because they are on the water they are immune to laws and have little risk of injury or death. I call that alcohol mentality that can lead to fatality. On our lake odds are if you see trash in the water, parks and on the islands the greater percentage of the time it is empty alcohol bottles showing that a lot don’t even have respect for the water and it’s surrounding areas. Also I agree that many of those who don’t drink and drink have no idea of the basic rules of the water. It’s bad enough when the adults do stupid things that endanger themselves but when they do stupid negligent things that put their children at risk that is especially bad. It seems to be getting worse every year. Neither my wife or I drink. My wife never did. I used to have a beer (12 pack or more). Quit in 1987, don’t miss it at all. However, I can’t believe the amount of wine consumed. I think people believe it’s not as bad as beer or whiskey. It is – they’re so drunk they can’t hardly walk. Some don’t. We’re looked at as different. that’s OK – We’re SOBER and enjoy it to the fullest. Unfortunately about 90% of boaters drink. Some more than others. It’s a bad situation for everybody, because drunks always think they have total control. SAD SAD SAD. While I agree that alcohol is an horrendously contributing factor to boating accidents, I believe, after significant boating on both coasts, that lack of boating knowledge in general is the worst offender. Except for the pro’s, nobody I have run across on either coast seems to have the slightest knowledge, or maybe respect therefore, of the most basic rules of the road. Again, outside of the pro’s, or professionally crewed yachts, the more expensive the boat, the less the operator seems to know. I am a huge supporter of mandatory education and licensing. A disturbing number of people do not seem to realize that piloting a boat inherently has more risks than driving a car-no medians to pull off on.